Warring Factions is a free, browser based, massively multiplayer, real time space strategy game. Built around a fully modelled universe with tens of thousands of systems and their associated planets, players can build thriving space empires. Join a faction to work with others to further your factions goals, or just fly solo with your own purpose. A completely open research system allows incredible customisation and personalisation of your ships and fleet compositions. Test your brains and brawn against the best the universe has to offer. Spread your empire throughout the universe, seeding untold planets with your citizens. With every planet being different, every colony becomes a different challenge to the one before. Do you want to build a scientific outpost? a military base? or just pump your apartment blocks to the rafters with as many people as possible. Warring Factions is fully supported by the community, using WF Coins as a way to let players spend real money to get coins in game that allow them to name planets, systems and more. 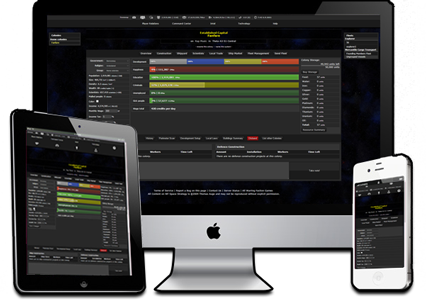 Our interface is fully responsive, resizing to fit whatever device you want to use. Portrait, landscape, phone, tablet or a large widescreen monitor, everything resizes to fit your situation. We have an android app that fully incorporates the game alongside real-time notifications and updates to keep you alart of any in-game happenings whilst you're not around. 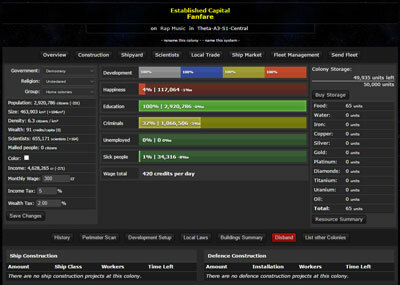 Using the extensive and fully player controlled research system you can continuously improve your ship technology. Build a fleet using the myriad of ship classifications, coordinate with your team mates to launch an extended military campaign and watch your enemies crumble. All ships are player designed and fully customisable, from the engine it uses to the guns it carries. Fill in the details below and we'll cross the T's and dot the lower case J's on getting you in charge of your own Space Empire. This is different from your username, used only for logging in. 5-12 alphanumeric characters. Your name as you wish to appear in-game. What would you like your intergalactic denizens to rejoice in the name of? In case you typed it in wrong before. So we can confirm you are a biological life mass. This faction currently has 22 rulers. Where does a fish go once it has grown legs? Suffering the fate of the early risers of evolution the Scaldarians were decimated time and time again by their grumpy and active planet. Barely surviving ice ages, only to expand heroically during the interglacial periods between them. Intelligence was a hard fought battle against nature, forcing the Scaldarians to learn how to survive several global extinction events. Once everything had rather settled down, the Scaldarians were left dominating their planet. Their culture, exposed to freedom for the first time, frantically searched for a new purpose. 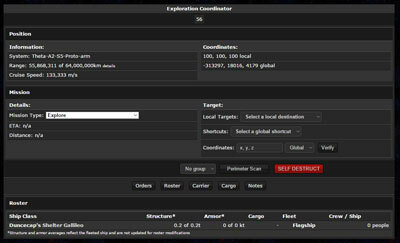 Cataloging their local stars and space, they searched for a new threat to prepare for. The astrologists learned of an area of space where light entered and never returned. Perceiving this new discovery as the object they had been searching for, the catalyst was set for expansion to the stars, planning to meet whatever they discovered head on. This faction currently has 26 rulers. Openly hostile and unable to work together in large groups, the Jarnekk form small groups of allies and constantly seek to gain an advantage over their fellows. This faction currently has 28 rulers. Death is certain. Glory is earned. Success is essential. By these three tenets the Archons have survived the comings and goings of a several millenia of conflict, prosperity and everything inbetween. Their philosophy remains sacred into the modern technology age, with those that achieve glory, whether it be financial, cultural or otherwise, being introduced to the Halls of Time; A record kept since records began of those deemed worthy of remembering. After local space exploration uncovered a strange anomaly the Arcons set their sights on success. Personal fortunes, corporate budgets and national reserves were quickly emptied into the nubile space industry and the Archons set off in search of their own histories. Warring Factions uses a custom built universe generator, generating tens of thousands of star systems with multiple galaxies. 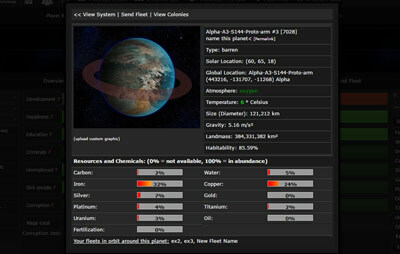 The generator fills these systems with unique planets, differing in size, landmass, atmosphere, gravity and the resources each planet contains. The universe is fully 3D and navigable using our proprietary 3D javasript engine. Warring Factions is an online strategy game played in real time. There are no ticks, turns or pay-to-win mechanics. Warring Factions has been in active development for over 12 years, going through multiple phases of different developers and styles. With a recent re-launch with an all-new interface that seemlessly transitions from a full desktop experience to handheld devices either through a web-browser or the android app. An active community that consists of veterans and new players alike, combining to dictate the entire path of each round. Developer interaction in game events is kept to a strict minimum in order to expose the playerbase to a dynamic narrative that is entirely upon themselves to create and play out amongst the stars.